Smoky Valley Ranch was the place I didn’t go to see. I went to Oakley, Kansas to see Monument Rocks and Lake Scott State Park, both recommended by a man named Mike Haddock, who runs a wonderful Kansas wildflower website. Oakley is not a destination site, but there are some interesting things to see there, and when I consulted the slim brochure I got at the Kansas visitors center after driving in from Colorado, I saw the ranch on the list. All I needed to see were the words ‘shortgrass and mixed grass prairie’ and that it is owned by the Nature Conservancy, and off I went. The roads through the farms and prairie south of Oakley are set out in the familiar grid of towns and counties that grew up in the flat grasslands, but you can’t be sure that any one road in the grid actually goes all the way through. So, I got mildly lost, but eventually found the Nature Conservancy headquarters, a metal barn at the end of a half mile driveway flanked with wildflowers. There’s a lot of land in western Kansas, and few people and houses, leaving vast farm fields surrounding the preserve, and even tucked in among its acres. Most grow wheat and corn developed to grow in the dry climate. The rest is grazing land, and the ranch’s 16,800 acres are run as working ranch, grazing both cattle and a herd of buffalo. Having evolved with both grazers and fire, the only way the prairie can prosper is in combination with both. Without these renewing forces, the old grass stems would choke the crowns at ground level and the plants would stagnate. 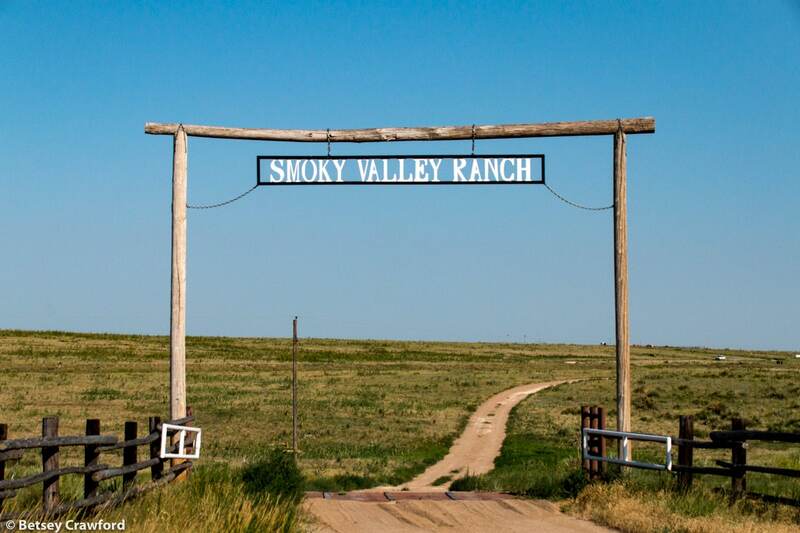 The mission of Smoky Valley Ranch isn’t just to preserve that particular prairie, but also to further develop grazing and burning methods that can be used more widely to save or renew remaining prairie. The second evening I went to take pictures around the headquarters, I met Matt Bain, the project manager, who seemed happy to talk, despite the fact that it was 7 pm. He described their grazing rotation, moving the herds from pasture to pasture as the season progresses, so that no one section is grazed more than 20% of the time, and each has a chance to recover. This is why I found few wildflowers on the only public trail on the land — that area had been an early season pasture this year. Kansas is the wheat capital of the United States. Corn is an industry represented by 20% of the merchandise in our local supermarkets, everything from the actual kernels themselves to corn-fed beef, to the sweetener in most processed foods, to the coating on the box of cornflakes. Farming on this massive scale involves agricultural practices that environmental advocates usually hope to change. I wondered how the local farmers felt about having the Nature Conservancy, one of the world’s premier environmental groups, in their midst. It wasn’t hard to imagine that the descendants of people who crossed an ocean and half a continent, and then slept on the ground under their wagons for their first season in the west, might not take kindly to suggestions about what to do on their land. I had a chance to ask. On my last evening near the barn, a Sunday, a man drove up in his truck and then out into the preserve on an all-terrain vehicle. He came back an hour later, and stopped on his way out to make sure I was all right. A very friendly local farmer, he said he’d gone out to check the water tubs for the cattle so the ranch manager could have a day off. I asked how the neighbors felt about the preserve, and he readily admitted that several were sorry they hadn’t bought the land when it was for sale in 1999. But when I wondered if the preserve’s advocacy for certain ranching practices was an issue, he said there were some nearby ranchers who were even stricter rotational grazers than the Nature Conservancy. ‘It’s not that,’ he said, adding, much to my surprise, ’It’s prairie dogs.’ These are one-foot high, hyperactive creatures that are always poking out of their holes and disappearing into them, chittering at me when I pass their ‘towns.’ I already knew from Matt that he wanted to reintroduce prairie dogs (and prairie chickens) into the ecosystem of the ranch. He’d mentioned that they had to keep them well inside the perimeter of the preserve because neighbors didn’t like them. Kansas law allows counties to exterminate them if they’re deemed pests. Their biggest predator, the black-footed ferret, once thought to be extinct, is only now being reintroduced. This last seemed like a good thing to me, but Tom said no, the local farmers weren’t happy about it. They don’t want easterners — I didn’t take this personally; I assumed he meant easterners from Washington D.C. — telling them they can’t farm a field because an endangered species is on it. There has been talk of adding the black-tailed prairie dog to the endangered species list, as well. But even ranchers in favor of working to restore prairie dog habitat are opposed to their being declared endangered, with all the restrictions that would ensue. ’Google Logan County prairie dog wars,’ he said cheerfully, before he drove off. So I did, and unleashed an online tempest. Ranchers fear that the dogs eat crops and compete with cattle for the grasses both depend on. They also object to the formation of prairie dog towns, created by a network of underground tunnels that can stretch 50 feet in all directions, and the piles of dirt that are thrown up around the many entrances to the burrows. This creates, one farmer said, a ‘moonscape,’ with further loss of grass, and with holes that, so it is feared, could be dangerous traps for cows’ and horses’ hooves. The wars don’t directly involve the prairie dogs on the preserve. There are two local farmers who want them on their property, and feel strongly that they not only belong on the prairie, but are an important part of the ecosystem. Which, traditionally, they have been. When they eat grass around the burrows, and snip off tall grass surrounding their town to more easily see predators, the dogs are reducing competition for other plants, especially flowers, whose seeds then feed the endangered prairie chicken and other birds. The steady clipping of plants also insures a continual crop of new shoots, which have more protein and nitrogen than mature stalks. In this more diverse and nutritious landscape other lives prosper, as well. Some are predators, like the swift fox and the ferruginous hawk. Some coexist, like the prairie chicken and mountain plover. Some animals live in the burrows with the prairie dogs, like mice, the burrowing owl, and snakes and other reptiles. Even the black-footed ferret — the one that eats prairie dogs — lives in the burrows with them, which is a very interesting arrangement. Bison and pronghorn antelope like the higher nutrition of the new shoots. The burrows themselves bring rainfall further down into the deep root systems of the prairie plants. So, from nature’s point of view, it’s a good idea to have prairie dogs, as long as the whole predator cycle is working to keep the population within sustainable bounds. From the human point of view, it’s endlessly complicated, with cross currents of angry neighbors comparing the dogs to an infestation of rats, and local governments, based on a hundred-year-old state law, poisoning the dogs and sending owners the bill. Some federal agencies are weighing unwanted interventions, another is accused of not intervening enough. Local ranchers are adamantly opposed to anything that would limit their ability to use their land as they see fit, or threaten their investment in crops and cattle. Wildlife advocates say the poison is killing other animals, as well. And while all this is being fought, there and elsewhere, the prairie dogs have lost 95% of their habitat. Land use issues are everywhere, and though the west is famous for them, eastern towns and cities have plenty to contend with. There are so many layers to all of these controversies: taste and preference, the common good and how that’s defined, the rights of owners, the rights of neighbors, the rights of the earth, the economic ramifications of limitations on use, the peace and prosperity of the community. And that’s just a handful of possible concerns. As I visit different prairies I have no doubt other aspects of these same tensions will show up. This is all far from the calm and beauty I found wandering the ranch’s acres. Matt told me a couple of places to go to find wildflowers. Just jump over the fence, he suggested, with a young man’s wild overestimation of a 65-year-old’s jumping abilities. And then added, be careful of electric fences. But I found openings that rewarded flexibility over vaulting and spent wonderful hours wandering the prairie, sometimes climbing unexpected hills, or walking among the trees in the Smoky Hill River valley, or along an outcrop of limestone holding 250 million-year-old fossil shells, remnants of a vast inland sea. We humans will never not be contentious, and perhaps shouldn’t even bother to contemplate such a homogeneous state, though we can strive for compassion when dealing with our differences. And we can go out into ancient landscapes, that evolved long before we did, and have wisdom we still aspire to, reminding ourselves that we are part of a long process, a tiny piece of a project billions of years old. In the prairie I am surrounded by thousands of mysteries, large and small. Birds, descendants of dinosaurs, sing from the tops of last year’s flower stalks. Grass roots reach deep into the earth under my feet, knowing how to find water. Flowers produce nutritious seed through their ephemeral beauty. Ancient sea life crunches in the dirt at my feet; thunderstorms blow wildly through; bison move in the distance. Multicolored grasshoppers leap up, buzzing, flying ahead of me as I walk through the grass. When they land again they magically turn into the color of the prairie. They know things I’ll never know. I love that idea. I’m filled with peace. A western meadowlark (Sturnella magna) in full voice. There are more pictures in the Smoky Valley Ranch gallery. This entry was posted in Ecology, Landscape and tagged Blessed Unrest, Kansas, landscape photography, native plants, nature photography, nature writing, prairie, sky, travel, wildflower photography, wildflowers, wildlife. Well, I looked at your opening photo and said… “Why is that a ‘ranch’? There’s nothing there!” As usual, shortly thereafter I was reminded that where WE may see “nothing,” you are there seeing much, and that our “nothing” is where just about everything real is happening. And you’ve got the pictures to prove it! so beautiful, so authentically you! Thank you so much, Deborah. What a lovely comment. I love the idea that you feel you’re there with me.